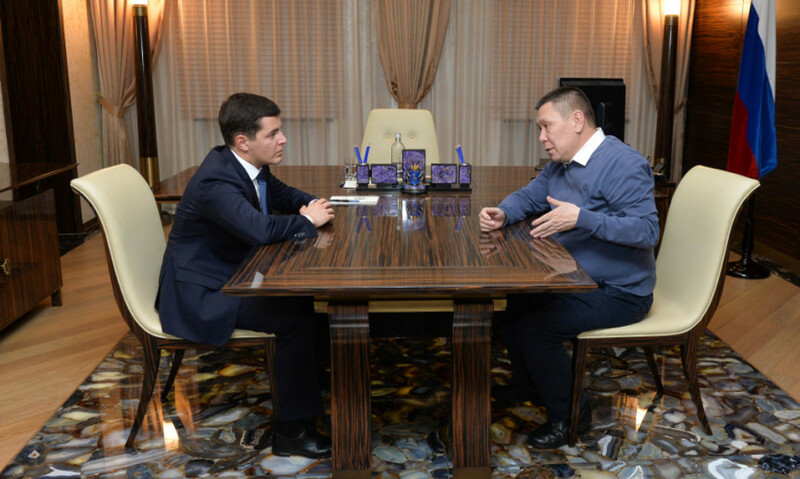 The governor of Yamal-Nenets Autonomous Okrug Dmitry Artyukhov and the president of the Russian Association of indigenous peoples of the North, Siberia and the Far East Grigory Ledkov discussed further plans of the all-Russian movement. The participants of the meeting voiced important initiatives having significance both at the regional and federal levels. Creation of the all-Russian register of indigenous ethnic minorities is one of them. This document will allow solving the problem of confirmation of national belonging and will become an effective mechanism in ensuring of guarantees of indigenous ethnic minorities of the North, including in the sphere of nature use. Today the lack of confirmation of belonging to indigenous ethnic minorities in documents, which certify the identity of a citizen of the Russian Federation, puts environmental and law enforcement agencies in a difficult position. In the same row there are those people, who fulfills control over catching of aquatic biological resources, hunting and visiting of specially protected natural territories. This problem is important for several regions of the country. Since 2012 the Unified Information System for modeling and forecasting of socioeconomic development of indigenous ethnic minorities of the North has been functioning in Yamal. According to the press service of the governor of Yamal, in conditions of absence of statistical observation it allows monitoring the situation of families conducting traditional lifestyle. Confirmation of the status of tundra residents to provide them with measures of social support was implemented after introduction of the Unified Information System in Yamal-Nenets Autonomous Okrug. Regional experience shows that the federal register of information on indigenous ethnic minorities also can be an effective mechanism for ensuring of rights and guarantees of this category of citizens. In addition, Grigory Ledkov told Dmitry Artyukhov about holding the fourth forum “Russian North” in St. Petersburg from the 25th to the 29th of November. Activities on thematic platforms will be divided into several spheres. Specifically designed interactive classes, master classes and quest games are waiting for young people. Development of the system of communication between representatives of indigenous ethnic minorities, state agencies and public associations is one of priorities of the event. This year representatives of the whole Arctic zone of Russia – more than 200 people — submitted their projects and legislative initiatives to the selection commission of the forum. The key issues touch upon education, attracting of qualified personnel to remote northern settlements and development of leadership skills. The most interesting initiatives will be announced at the parliamentary hearings in the State Duma of the Russian Federation on the 16th of November and during the forum. As we should remind, the team of Yamal won two grants in 2017 in “Russian North” for the project “Let us make Samburg cleaner together” and translation of the famous comic book into Nenets language.